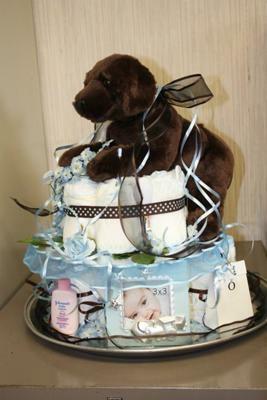 This darling labrador puppy dog diaper cake gets my sister's vote for her favorite diaper cake because she LOVES her labrador, and because this is such a cute diaper cake! All the accessories go so well with it, the colors are perfect and the chocolate lab on top is downright adorable. Wendy made this happy little diaper cake and wanted to share it with the rest of us. She is "paying it forward" by sharing her ideas to inspire others. Wendy, from all of the puppy lovers out there, thanks for sharing such a fun diaper cake! My first one took me a little longer than what I see out here posted...LOL! ; BUT I loved it! 1. 1st layer - One package of size 2 Huggies diapers (wrapped two together)& didn't know to use a large bath wash (or similar) as the center; so used all diapers. 8. Lab puppy - everybody who knows me and my dogs knows that I love labradors! So, the lab topper seemed very fitting.